In this report, we will dig into how to improve your call center experience–from the caller’s point of view. Call centers have many different ways of handling calls. We all have had some disappointing experiences when calling a company for information, customer support or technical help. When calls come in, a recorded voice greeting provides multiple options. As a call center manager, you’re interested in the entire caller journey, so it makes sense to create a map of the way the caller travels through your system. The elements you’re working with include caller activity, IVR audio and time. Caller Activity. How much work must the caller do to reach the intended destination? Should Spanish or other languages be offered? If the caller doesn’t respond at all, does the call menu repeat or does the call get transferred to a designated queue? TIP: Consider avoiding the statement, “to repeat this menu, pres…”. It’s more efficient to have the menu automatically repeat if there is no response. This results in fewer caller options. Audio. What will the caller hear? If the IVR was voiced by someone in the office or the phone installer, you may be creating an unprofessional call center experience. Does a male or female voice suit your brand better? Male voices can be authoritative as well as friendly (and even cheesy). A female voice can be inviting, caring and approachable. What languages are to be offered? Easy On Hold provides an international IVR voice talent roster with 48 languages and dialects. If the caller must be told that the call may be recorded or monitored, when is the best time? Consider delaying this message until absolutely necessary. The goal is to get the caller to the answers she seeks. Time. How long does it take to lay out all interactivity options? How many options are too many? TIP: Place the most commonly-used option first to save callers time. 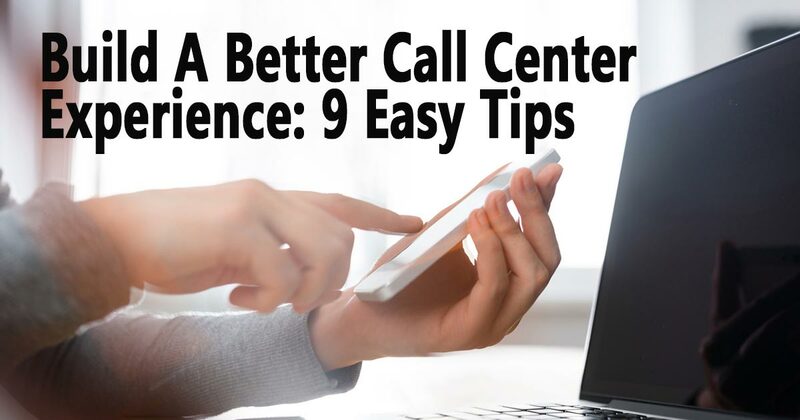 A quick pathway to the caller’s destination creates the best call center experience. 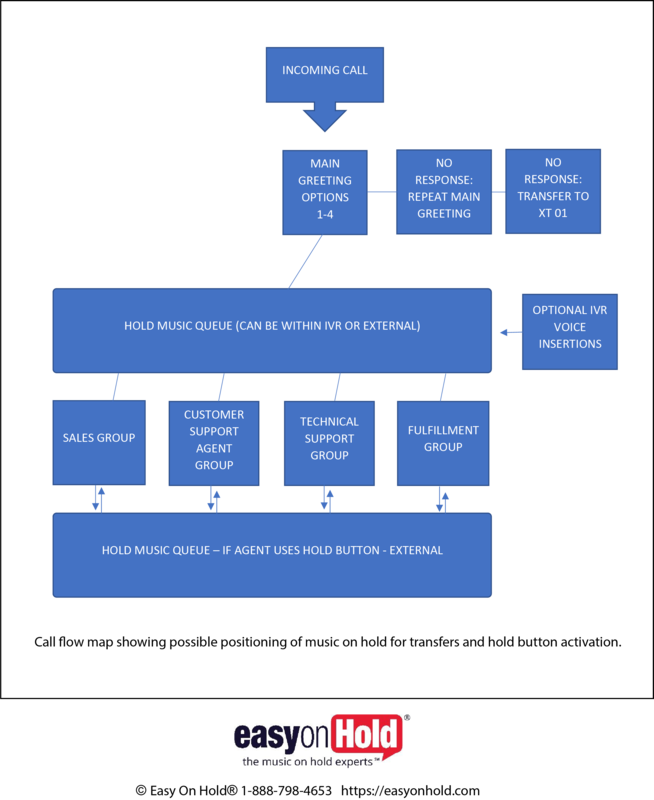 Notice from our call flow map that hold music may be positioned within the IVR for callers to hear while being transferred, or after the call has reached the agent. In either case this music may be a static audio file that plays continuously or from the beginning, or a group of music on hold files or even a live hold music stream. After the agent picks up the call, the hold button may be used, playing a hold music queue. This may be the same music as the transfer music or something entirely different. TIP: Consider a unifying sound across the entire call center experience. Is your hold music ruining your call center experience? Increasingly, telephony platform providers have been reinventing the technology behind call flow. Unfortunately many have deleted the best sounding hold music options in the process. Too often the hold music can only be a poor-quality 8-bit audio file that plays from the beginning every time a caller has to wait. This may result in the caller hearing the same music or message more than once during a call, leading to a repetitive and unpleasant call holding experience. Do not use the default music that came with the phone system. These lifeless anthems are loathed the world over. Remember, phones (especially mobile phones) are made to transmit voice. Voices sound better than music. All “phone on hold” content must be properly licensed. Talk to your telephony platform administrator to determine options for playing music. The most flexible option is streaming music on hold. If files must be used, check to see what the audio file format is and ask, “who will change the audio files in the future?” Read our article on music files.